The body’s branching network of peripheral nerves connects neurons in the brain and spinal cord to organs, skin, and muscles, regulating a host of biological functions from digestion to sensation to locomotion. But the peripheral nervous system can do even more than that, which is why DARPA already has research programs underway to harness it for a number of functions—as a substitute for drugs to treat diseases and accelerate healing, for example, as well as to control advanced prosthetic limbs and restore tactile sensation to their users. Now, pushing those limits further, DARPA aims to enlist the body’s peripheral nerves to achieve something that has long been considered the brain’s domain alone: facilitating learning. The effort will turn on its head the usual notion that the brain tells the peripheral nervous system what to do. The new program, Targeted Neuroplasticity Training (TNT), seeks to advance the pace and effectiveness of a specific kind of learning—cognitive skills training—through the precise activation of peripheral nerves that can in turn promote and strengthen neuronal connections in the brain. TNT will pursue development of a platform technology to enhance learning of a wide range of cognitive skills, with a goal of reducing the cost and duration of the Defense Department’s extensive training regimen, while improving outcomes. If successful, TNT could accelerate learning and reduce the time needed to train foreign language specialists, intelligence analysts, cryptographers, and others. The program is also notable because, unlike many of DARPA’s previous neuroscience and neurotechnology endeavors, it will aim not just to restore lost function but to advance capabilities beyond normal levels. DARPA intends to take a layered approach to exploring this new terrain. Fundamental research will focus on gaining a clearer and more complete understanding of how nerve stimulation influences synaptic plasticity, how cognitive skill learning processes are regulated in the brain, and how to boost these processes to safely accelerate skill acquisition while avoiding potential side effects. 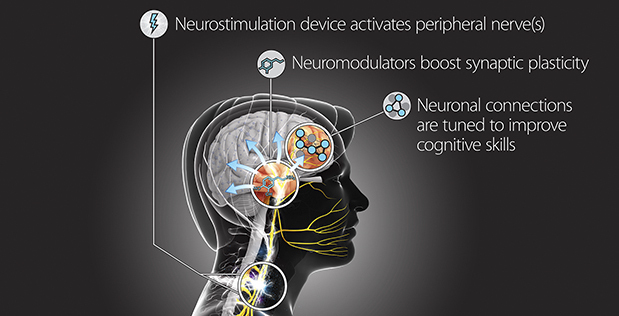 The engineering side of the program will target development of a non-invasive device that delivers peripheral nerve stimulation to enhance plasticity in brain regions responsible for cognitive functions. The goal is to optimize training protocols that expedite the pace of learning and maximize long-term retention of even the most complicated cognitive skills. To meet these diverse objectives, TNT expects to attract multidisciplinary teams spanning backgrounds such as cognitive neuroscience, neural plasticity, electrophysiology, systems neurophysiology, biomedical engineering, human performance, and computational modeling. To familiarize potential participants with the technical objectives of TNT, DARPA will host a Proposers Day on Friday, April 8, 2016, at the Westin Arlington Gateway in Arlington, Va. The DARPA Special Notice announcing the Proposers Day and describing the specific capabilities sought is available at https://www.fbo.gov/spg/ODA/DARPA/CMO/DARPA-SN-16-20/listing.html. A Broad Agency Announcement with full technical details on TNT will be forthcoming. For more information, please email DARPA-SN-16-20@darpa.mil. Image caption: TNT technology will be designed to safely and precisely modulate peripheral nerves to control synaptic plasticity during cognitive skill training.